The writing is done, the photography is finished, it’s been proofed, printed, and it’s now being shipped. Yes, the much-anticipated Issue No. 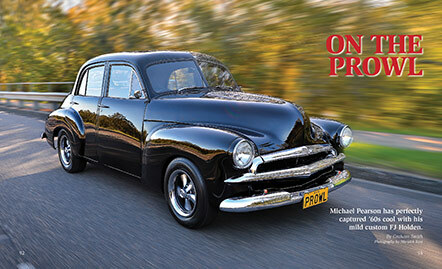 8 of Australian Hot Rodder is on its way from the printers. 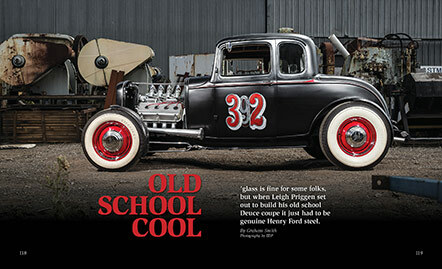 With the sharp ’33 Ford Sort Coupe of third generation hot rodder, Kev Kracht on the cover, Issue No. 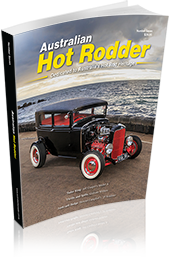 8 of AHR brings Australian hot rodding alive with great stories and stunning photography on some of the best hot rods and hot rodders this country has produced. 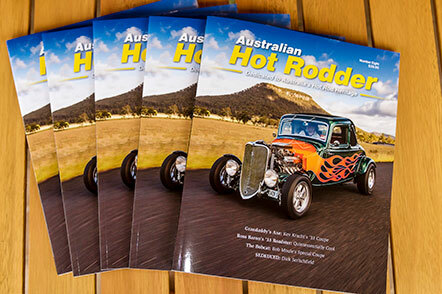 Issue #7 of Australian Hot Rodder has arrived from the printer so we thought it was time to open the pages and let you sample the great features we’ve assembled for you. 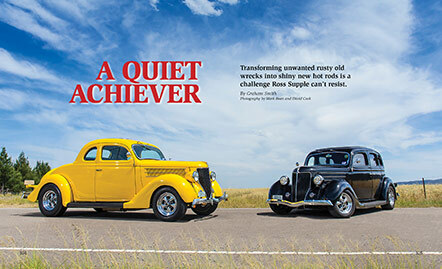 Featured on the cover of AHR #7 is Jeff Cooper’s stunningly detailed old-style Model A Tudor, a car that helped kick-start the popularity of nostalgia hot rods. 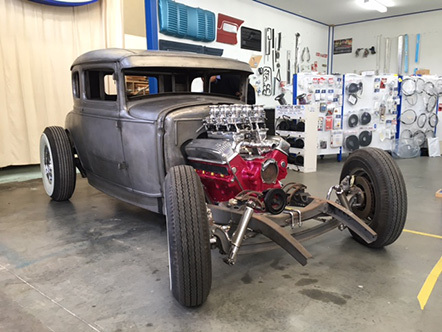 Talented young hot rod builder, Steven Alldrick, allowed us into his Deluxe Rod Shop to follow the build of David Murphy’s beautiful channelled Deuce roadster. Few racers were more popular in the 1960s than Ken Spence, the young farmer from country Victoria who delighted in putting on a tyre-smoking show in his Cobra Zephyr. When Phil Taylor decided he wanted a hot rod he turned to his mates at Rotunda Revival who built him a very sharp ’60s-styled ’35 coupe. 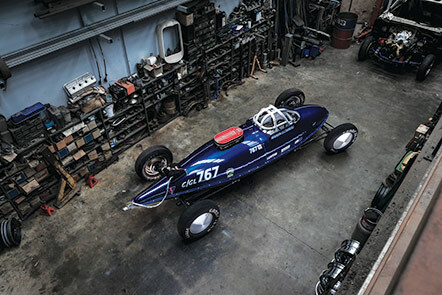 Going 200 mph was walk in the park for Peter Warren and his home-built belly tanker. A desire to be different and a love of MOPARS was Stewart Campbell’s motivation for building his ’29 Dodge roadster. 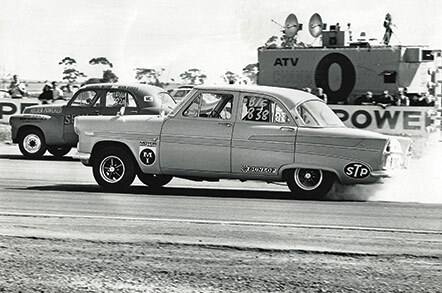 Graham Withers changed the face of Australian Top Fuel racing in the 1960s, but it wasn’t all plain sailing. 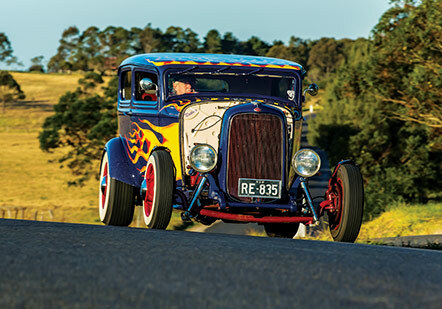 Long time Sydney hot rodder, Ray Ellis, wanted a family- friendly hot rod when he built his True Blue Deuce Tudor. 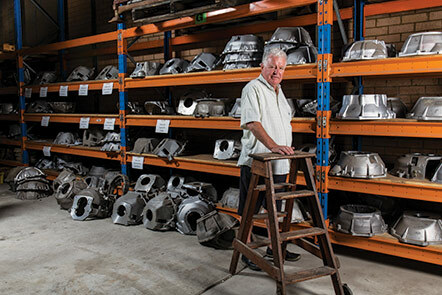 He co-founded the Romans Hot Rod Association in 1960, but supplying hot rodders with their parts was his true calling. Murray Richards not only built one of the sweetest early hot rods from the 1950s, he also helped his mates build their cars as well. 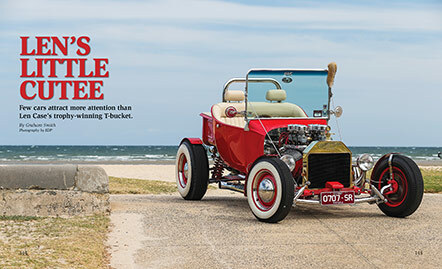 Russ Odlum’s cute Model A roadster is still celebrated as one of South Australia’s classic early hot rods. To order your copy, click here, or phone 0409 705 062 now. Looking for the perfect Christmas gift for that special hot rodder in your life? 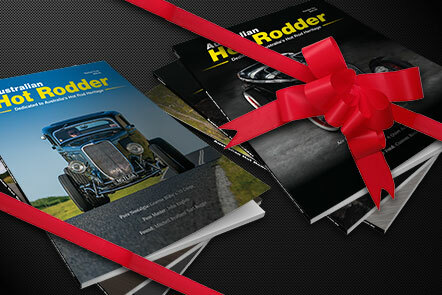 Australian Hot Rodder’s special gift packs could be just what you’re looking for. There are three packs to choose from, the Starter Pack, the Builder Pack, and the Big Daddy Pack. The AHR Starter pack gets you copies of AHR issues #1, #2 and #3, the AHR Builder pack gets you copies of AHR issues #4, #5 and #6, and the Big Daddy pack gets you copies of all six issues of AHR published to date. Price of these special offers is just $60 for the Starter and Builder packs, and only $120 for the Big Daddy pack. Best of all we send them to you post-free. Order now to ensure you receive yours in time for Christmas. Melbourne turned on its best weather for the launch of AHR#6 and hot rodders came from near and far to join in the fun. Peter Ingram, then owner of the fabulous ’32 tub on the cover drove down from Albury, Michael McLachlan made the journey down from Wagga, while others came from all over Melbourne. 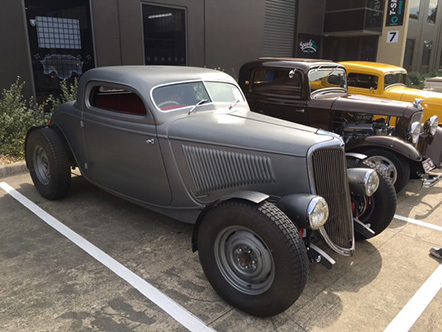 Leigh Priggens’ old school ’32 coupe took centre stage. Among other cars seen at the event were Doug Smith’s sharp new ’34 coupe, Ron Smith’s recently acquired ’32 coupe, and Jason Davin’s cool Model A coupe. 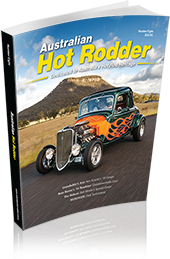 As has become tradition with the launch of each new issue of Australian Hot Rodder we are calling all hot rodders to the launch of AHR #6. 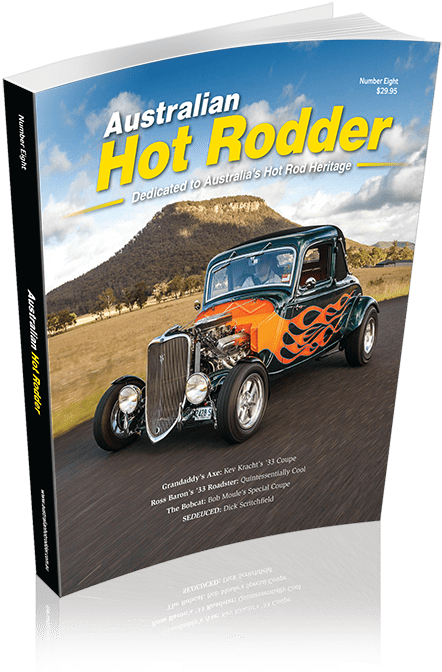 AHR #6 is jam-packed with entertaining features and fabulous photography on great Australian hot rods, pioneering hot rodders, and drag racers. 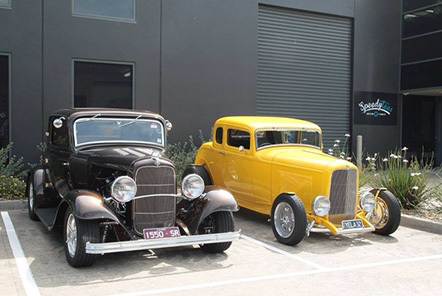 The event will be held at The Rubber Connection, Factory 6, 355-365 South Gippsland Hwy, Dandenong South on Saturday, October 15 and we are expecting a large turnout of hot rods, customs, and classic cruisers. 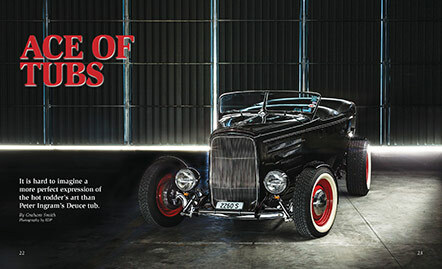 Bring along your favourite ride and meet the people who put Australian Hot Rodder out. It all starts at 10.00 am and will wrap up around 2.00 pm. The Bay Rodders will be running a sausage sizzle on the day, and drinks will be available. Copies of AHR #6 will be available to purchase at the launch, along with copies of earlier issues in case you’ve missed any. For more information call AHR on 0409 705 062, or The Rubber Connection on 03 9799 1012. With the shipment now on its way from the printers we thought it timely to give you a look at the many features in AHR #6. The journey that began as AHR #5 was being sent out to our loyal readers has been a long one, but we think it’s been worthwhile as we’ve been able to assemble a fine collection of features on some of the most interesting characters and finest cars in Australian hot rodding. 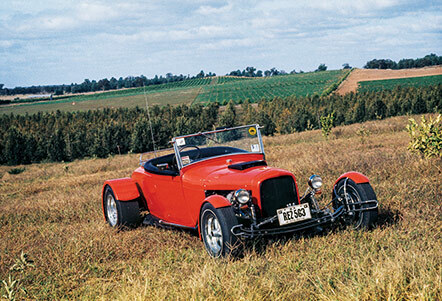 There are few more iconic Australian hot rods than Peter Swift’s T-bucket. 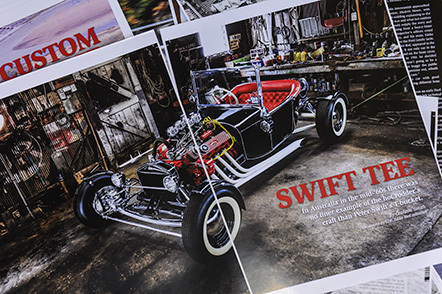 Built back in the early ’60s when hot rodding was just finding its feet in this country, Swifty built a standout car that inspired a legion of aspiring young hot rodders to get into the hobby. We sat down with Swifty and listened as he told us his tale firsthand. 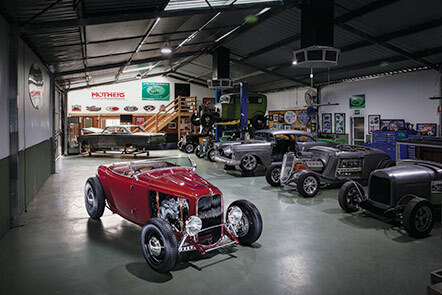 The tourer has never been the most popular body style with hot rodders, most preferring coupes or roadsters, but Peter Ingram showed how good a tourer, or tub, could be when he built his beautiful black Deuce tub in the late- ’80s. Pete took the time to tell us how it came to be, and its tale of traveling to America and back again. 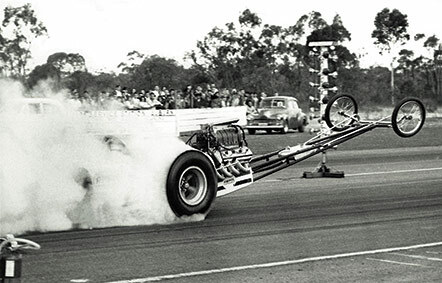 No one did more to spread the word about hot rodding in Australia than Eddie Ford. Eddie and his mate Jeff Dellow started Custom Rodder magazine in 1967. 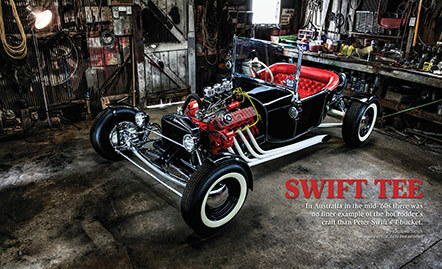 It was the first Australian hot rod magazine published by hot rodders with a passion for the new and exciting hobby. Eddie and Jeff took the time to tell us how the magazine came about. You don’t see many hot-rodded Dodge Victory Six coupes, but Paul Body and Stewart Campbell created one very slick hot rod with a very traditional character. 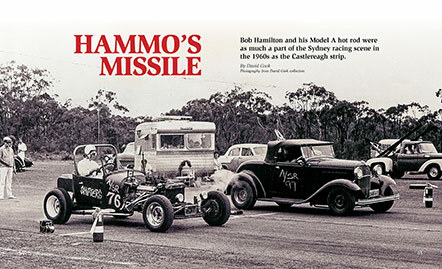 Bob Hamilton and his Model A bucket were larger than life parts of the fledgling Sydney hot rod scene in the 1960s. David Cook managed to sit down with Hamilton who told us how it was back then. 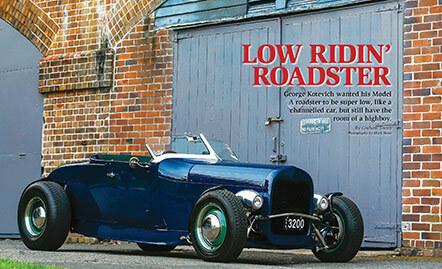 George Kotevich is best known for the channelled ’32 roadster he owned in the 1960s. Gary Wright originally built the historic roadster but sold it to George in the late 1960s. It became even more famous after George rebuilt it. George’s current Model A ride is reminiscent of that great old hot rod and he tells us all about it. Old Holdens were as cheap as chips in the 1960s and customised early models were a common sight on our roads. It’s rare today to see these old cars, but Michael Pearson has managed to create the vibe with his custom beauty. 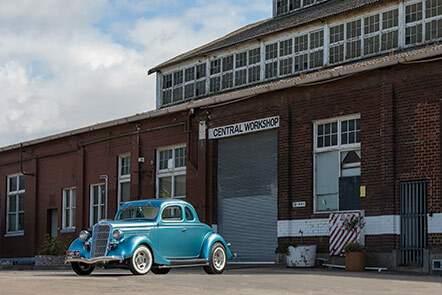 Ross Supple loves the challenge of bringing a rusty old Ford back to life as a bright new hot rod. As he told us when we went to visit him he’s been doing just that for years, and there’s no sign of him slowing any time soon. 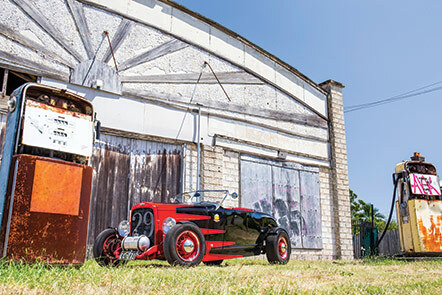 There’s nothing better than an old school style ’32 coupe and Leigh Priggen has perfectly captured that old-time feel with his freshly built Hemi-powered Deuce. 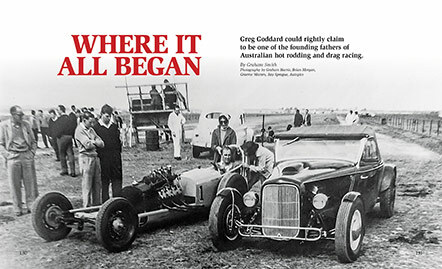 Greg Goddard built and raced what is widely regarded as Australia’s first dragster when he competed in his flathead-powered rail at the races staged at Pakenham in the late 1950s. Len Case can’t go anywhere in his red T-bucket without coming home with a trophy. It simply stands out from the crowd and attracts attention every time he takes it out. After signing off the colour proofs of the new Australian Hot Rodder #6 we’ve given the printer the green light to fire up the presses. 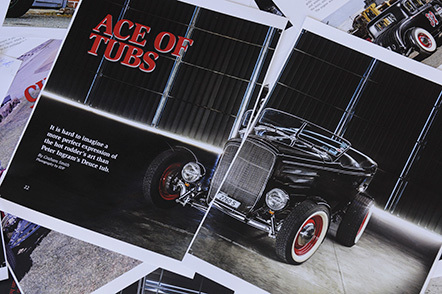 The front cover of AHR #6 features Peter Ingram’s beautiful black ’32 Deuce tub, one of the sharpest hot rods built in this country. Our feature plots the stunning tub’s build and then follows its journey across the Pacific to its new California home and back again. 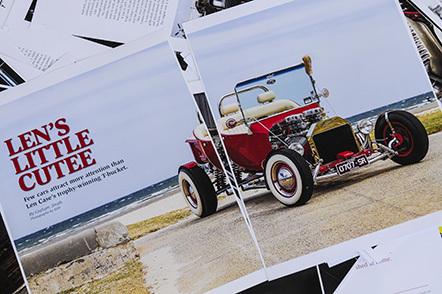 Peter Swift’s legendary T-bucket is featured on the back cover. Built in the early 1960s, Swifty’s bucket inspired many young hot rodders in the formative years of the hobby in this country. 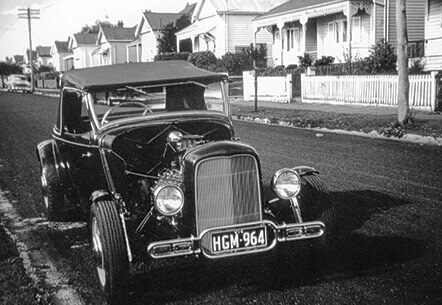 Len Case was one of those young hot rodders who was inspired by Swifty’s T-bucket after seeing it in 1965 at the first Victorian Hot Rod Show. It took 40 years or more for him to finally realise his dream, but the result is worth it. We chronicle the story of his trophy-winning bucket. 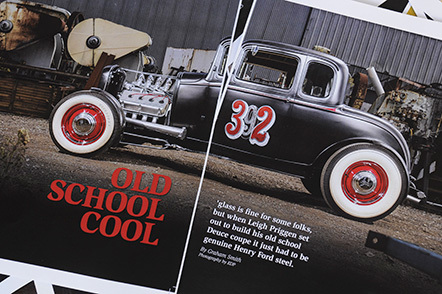 When Leigh Priggen set out to build a new hot rod, it had to be steel and it had to have an old-time feel. The result is this very cool Hemi-powered five-window Deuce coupe. 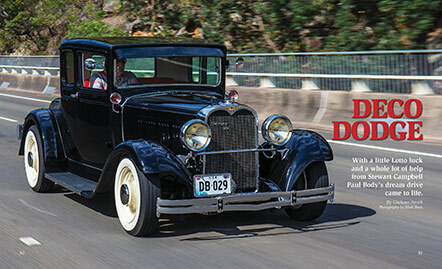 But we didn’t stop there, AHR #6 is jam-packed with features on Eddie Ford’s landmark Custom Rodder magazine, Paul Body’s art deco era Dodge Victory 6 coupe, George Kotevich’s sweet Model A roadster, Michael Pearson’s early Holden custom, plus the exploits of Bob Hamilton and Greg Goddard. 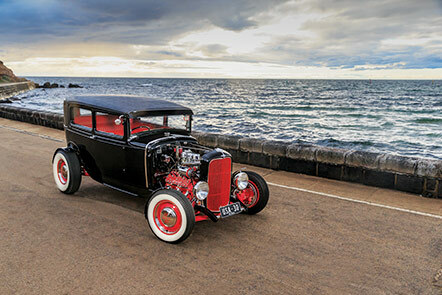 It is with great sadness that we report the passing of Tasmanian hot rodding legend, Andy Morris. 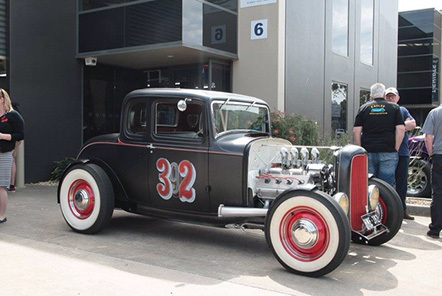 Australian hot rodding lost one of its true giants when Andy passed away on the evening of Monday, February 1 after a long battle with illness. Andy will long be remembered for his quirky approach to hot rodding, and his ability to make anything and everything, often from what other people would have thrown away. His Model A tourer was a tour-de-force of engineering excellence with its unique suspension, V8 engine and for Andy’s use of his AM initials all over it. Some laughed at it when he first brought it to mainland hot rod runs in the early 1970s, but those who were game enough to go for a ride with him returned understanding that it was special. 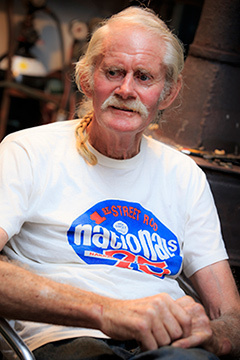 I feel privileged to have been able to sit down with him in his shed in Cooee and interview him for the story on his life in hot rodding we published in Issue #3. The time I was able to spend with him was very special; even though he was clearly ailing he readily gave us his time and an insight into his unique approach to hot rodding. RIP Andy, you’ll be sorely missed. 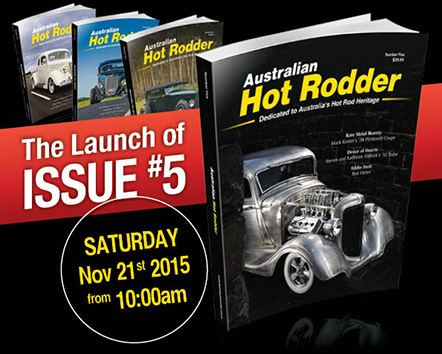 It’s become tradition that each new issue of Australian Hot Rodder is launched with an official function, and #5 is no different. This year’s event will be held at The Rubber Connection in South Dandenong and the indications are that it will be special. Joe Pirotta has agreed to bring The Crimson Pirate along. It will be the first time Joe has showed his iconic hot rod in public since the launch of AHR #1 at his factory. The Crimson Pirate was featured on the cover of AHR #1. 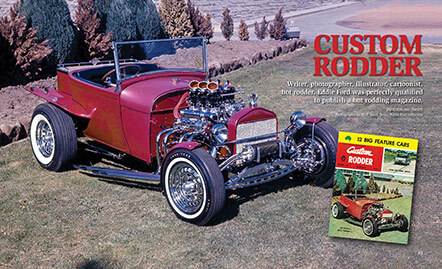 It was also on the cover of the first issue of Eddie Ford’s Custom Rodder magazine way back in 1967. Along with The Crimson Pirate there will be another Pirotta classic, this one the wildly customised Customline of Charlie Pirotta that he dubbed Dazzle. John Gladwell now owns Dazzle, and he has agreed to give it a rare outing by bringing it along on the day of the launch. Dazzle is one of the cars featured in AHR #5. Another feature car from AHR #5 to be at the launch is the beautiful Apple Green highboy Deuce Tudor of Steven Alldrick. The launch starts at 10.00 and will wrap up at 2.00 pm at The Rubber Connection, Factory 6/355-365, South Gippsland Hwy, Dandenong South, VIC. Copies of AHR #5 will be available to purchase at the launch, along with copies of earlier issues in case you missed out.